There is a story in Hindu mythology that the Gods and the demons, once decided to churn the sea to bring all of its wealth out on its surface. The story talks of many things emerging out of the sea, including a Goddess and the elixir of life. There is also a popular Greek myth of God Taras, son of Poseidon, who was saved from shipwreck by a dolphin and he emerged out from the sea riding a Dolphin. I am sure that no educated person would believe in and take such stories seriously. If one looks at the sea with its vast, mind staggering storage of water and rolling and thundering waves angrily crashing on the shores or if standing on the deck of a ship, looking at unfathomed depths of the sea all around, it is almost impossible to imagine that anything can really emerge out of the sea perhaps except for man made submarines. Yet the unbelievable has happened for few people living near Pakistan's southwestern Makran coast. Gawder is a major coastal town and a port on this coast. People from this town were shocked to the core on Tuesday, 24th September as they were jolted by a major earthquake as a deadly magnitude 7.7 earthquake struck in the remote district of Awaran in Pakistan's Baluchistan province. Yet the real sock and surprise came half an hour later when they saw a new island emerge in the sea, just over a Kilometre from the shore. A local journalist, Bahram Baloch, says “ I stepped out, and was flabbergasted. I could see this gray, dome-shaped body in the distance, like a giant whale swimming near the surface. Hundreds of people then gathered there to watch it in disbelief." Mr Baloch and his friends borrowed a boat and started for the island next day or on 25th September 2013, and managed to successfully land on the island. He says that it's an oval shaped island which is about 250ft to 300ft (76-91m) in length, and about 60 to 70ft above the water. It has a rough surface, much of which is muddy and some parts are mostly made up of fine- to coarse-grained sand. One part of it is solid rock, and that is where Mr Baloch and his friends landed. He says that there were dead fish on the surface and on one side they could hear the hissing sound of the escaping gas. Then they did something very dangerous. Since though they couldn't smell methane, they simply put a match to the fissures from where the gas was oozing, and set it on fire. To put off the fire turned out to be daunting task as not even the water could extinguish it. Finally they poured buckets of water over it and the fire was doused. The Makran coast line is about 700 Km long from east to west, and is characterised by high seismic activity. It is home to several hills called mud volcanoes, having craters at the top from which methane gas seeps out. The sea from Gwadar to Ormara has a vast stock of frozen methane gas below the sea bed and it is not uncommon to see bubbles in the water caused by methane gas escaping from fissures. However this incident is not the only one of its kind in this region as similar kind of hills have emerged out in the past too. 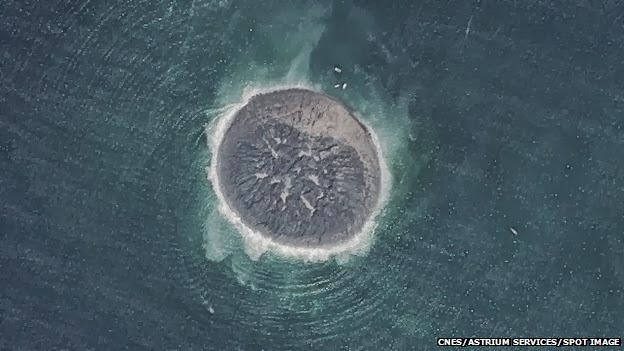 Since 1945, three more islands have popped up near Gwadar. 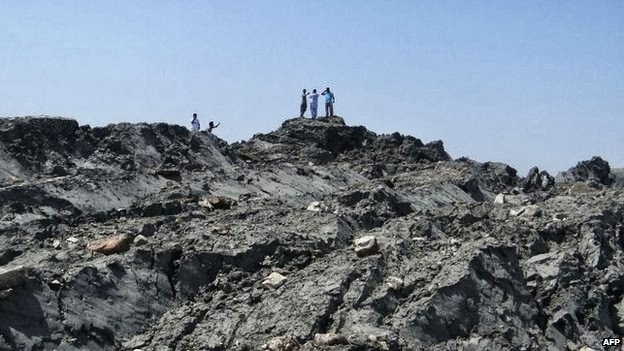 Pakistani authorities are trying investigate whether this island is in fact a mud volcano. Since the earlier islands have submerged back to sea, it is possible that even this new island may disappear after few months. 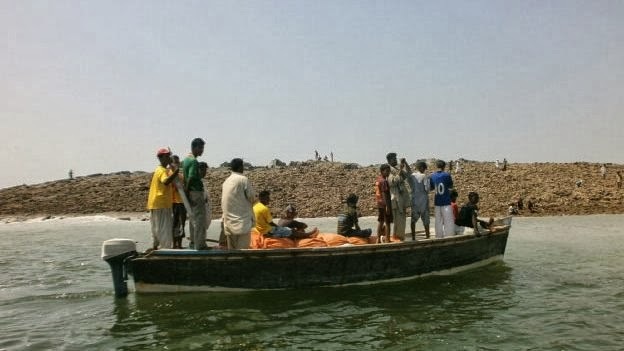 According to a statement released by Pakistan's National Disaster Management Authority, the island, which emerged around 3 miles offshore, rises as much as 30 feet above sea level at some points. 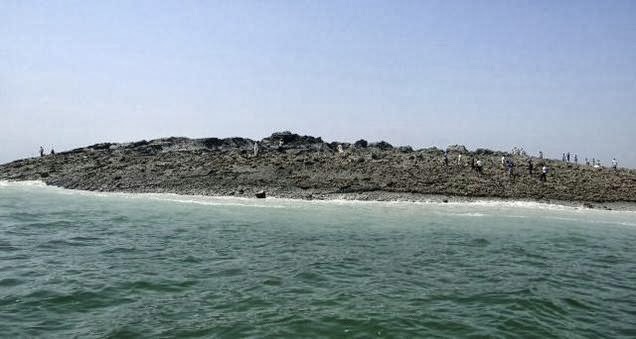 Director general of Pakistan's National Institute of Oceanography, Ali Tabrez, says that he has sent a survey team to Gwadar to take measurements, collect samples and study the features of the island. 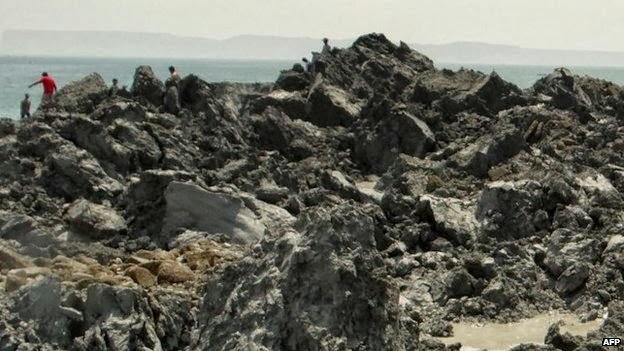 According to him the island appears at first glance, similar to formations that emerged in 1999 and 2010, when trapped gases under the sea bed were released by seismic activity. He said the formation was still emitting gas and people shouldn’t go too near since there was some movement below the sea bed. No boating or fishing should be allowed either. There is one thing, that should be clear from this incident, islands do not take years or centuries to emerge out from the sea. It can happen within minutes. Interesting!